Absence makes the heart grow fonder. And Procol Harum's return to touring after a 15-year layoff brought out 800 loving hearts at the Winter Garden Theatre last night. 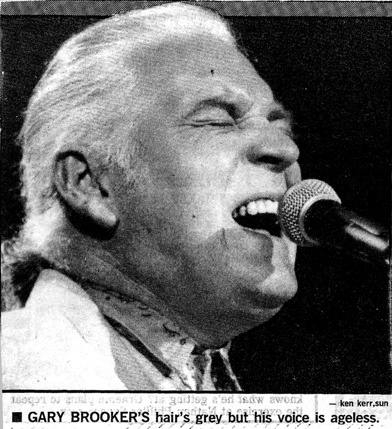 The opening number, the curiously murky Shine on Brightly proved that singer Gary Brooker – although considerably older and greyer – has lost none of his vocal charisma. The song also provided the audience – mostly in their 30s and 40s – an easy opportunity to reacquaint themselves with one of their longlost musical heroes. Of course the group peppered their show with several numbers from their new album, the Prodigal Stranger. Most drew an enthusiastic reception, particularly, Man With a Mission, All Our Dreams are Sold, and The Truth Won't Fade Away, a number that most closely approximated the high emotional drama of much of Procol's earliest and best work. Still, it was that earlier material which drew the most enthusiastic reception of the night. Their one certified mega-hit, 1967's A Whiter Shade of Pale, was highlighted by the moody Bach and Brahms-like organ swirls of fellow Procol original Matthew Fisher. Meanwhile, 1974's Nothing But the Truth began with a rousing gospel beat by Brooker before breaking into a steady rock groove. Best of all was the passionate A Salty Dog, highlighted by Brooker's trademark heart-wrenching vocal delivery. Like the best of Procol Harum's work, it was grandiose, eloquent and elegant, without suffering from pompous artiness. Just the same, Procol isn't entirely innocent in that department. At times, they've been pretentious and ultimately overreaching in their endeavours. Most notable was last night's rendition of Bringing Home the Bacon featuring group lyricist Keith Reid's oblique lines Milk fed baby dumpling / slobbering goo faced mean / Wet nursed sour purse spot face, blubbering in the cream. Reid always did have a predilection for rhyming gobbledegook and Bacon remains one of his classics. Yet, his newly-penned material has a more insightful and introspective bent. All in all, Procol's return proved a welcome chance to bask in their sometimes exotic work. At the same time, it confirmed that while you can glance back over your shoulder, you can't go back to what you once had and treasured.